Allows you to broadcast video in real time on your smartphone or tablet screen. Allow you to keep the house secured 24/7. Allows to record up to 5 consecutive days of video and store it locally. Free App for IOS/Android. No need battery. 24/7 live streaming allows you to monitor your home or business from your phone using mobile application. Best for monitoring homes, baby, pet, dogs, small offices, and retail businesses. 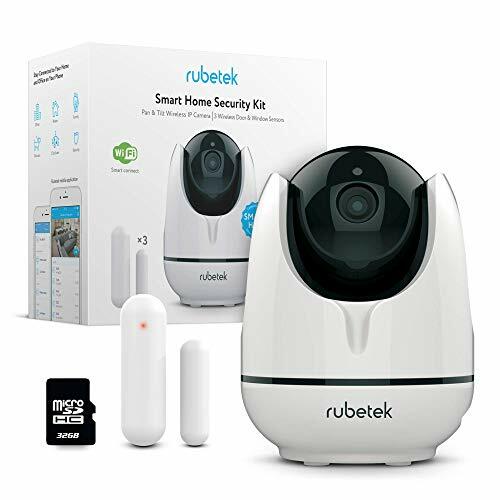 The security camera is, а part of the Rubetek system and allows you to connect other sensors. The Sensor determines whether a window or door is closed or open. When securing the house, in the event that a sensor is triggered, the user will receive an alarm signal on their smartphone via push notification. The 720p high definition wireless ip mini camera bundle provides a complete, cost-effective network video surveillance solution. Stay connected to you home and family everywhere. Use two-way audio connection to be on line anytime at any place of the world. When the camera is secured if motion sensor is triggered, the security camera will turn on the alarm signal and send a push notification to your phone or tablet. The camera can be operated without batteries. The Door/Window Sensor is extremely compact. You can easily mount the sensors on the door or on the window and get instant alerts on your phone or tablet when the sensor is triggered. Detect closing and opening of any door/window or garage door openings. If you have any questions about this product by Rubetek, contact us by completing and submitting the form below. If you are looking for a specif part number, please include it with your message.